Chicagoans are fortunate to have two major art museums and many medium and small galleries, where you can see a vast array of classic and contemporary art. I took advantage of that this week, seeing Rene Magritte’s “elective affinities” and Josef Koudelka’s photographs at the Art Institute, and Ed Paschke’s vivid character studies at the new Ed Paschke Art Center. Magritte is the current major exhibit at the Art Institute of Chicago. You’ll find it in Regenstein Hall, on the second level near the rear of the building. One of the benefits is that you get to walk thru the beautiful hall of Asian sculpture, which is displayed in a setting of rich golds and oranges. Then, when you turn right and walk up a short flight of stairs, you’re greeted with the hallway of Ellsworth Kelly color-field paintings, one of my favorite exhibits. 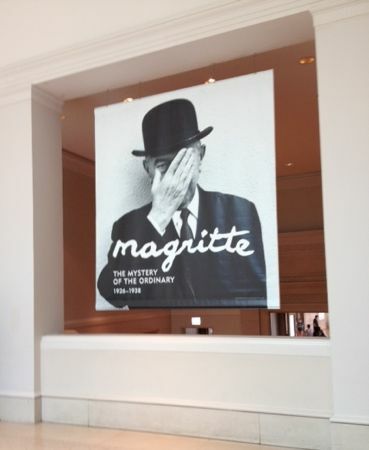 The Magritte exhibit runs until October 13 and it is well worth seeing, both for the art itself and for the creative way the work is exhibited. Magritte’s art was influenced by his work in advertising and theatrical design as well as by his connections with Andre Breton and Tristan Tsara, the founders of surrealism and of the Dada movement, respectively, as well as Salvador Dali and Joan Miro. Magritte’s work is bizarre, quirky, and deliberately deceptive and shows his keen and intelligent sense of humor. One of his best-known works is the word-image painting, “The Treachery of Images,” a smoker’s pipe with the legend, “Ceci n’est pas une pipe.” Another work titled “The Interpretation of Dreams,” shows a two-by-two grid; each square includes an image and a label. But three of the four are labeled whimsically. Only the valise is in fact labeled as a valise. Most of his paintings are subtle and sometimes mystifying, like “Entr’acte,” a 1927 painting showing disembodied leg-arm parts on a stage-set background. In “Not to be Reproduced,” we see the back of a man looking in a mirror at the back of his own image. In a painting titled “La Clairvoyance,” a painter (Magritte himself?) paints a large bird while looking intently at his model, a pristine egg. Here’s a video teaser about the exhibit. Curator Stephanie D’Alessandro is to be commended for bringing in Canadian opera director Robert Carsen to design the imaginative setting for Magritte’s work. No large white galleries here. Instead, the walls are dark gray and the only illumination is on the paintings themselves. The space swerves and snakes thru the display area so you only see one or a few works at a time. Near the end, there’s a series of very small galleries, like the tiny side chapels in a cathedral, each with one work hanging alone for your bemusement. Trust me, it isn’t depressing. Magritte puzzles and amuses. You’ll find yourself laughing aloud at some of his “mysteries.” Go on a day when you need a mood enhancer. The Art Institute also is showing a large exhibit of dramatic photographs by the Czech-born Magnum photographer, Josef Koudelka. They’re displayed on the main level of the Modern Wing. 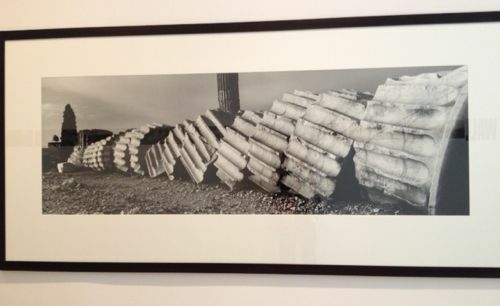 In one gallery are his panoramic landscape photographs, some large and framed, and smaller ones, displayed in horizontal bands across the gallery walls. His landscapes are not green and pastoral. He photographs old industrial and mining sites, destroyed monuments and the detritus of modern life. Across the hall in a second gallery are two very moving exhibits of human scale. “Gypsies” is composed of 22 photos, portraits of musicians, individuals, groups and interiors showing the lives of the Roma people, photographed in Rumania, Slovakia and the “Czech lands.” They’re grainy, black and white, and very human. Most stunning is a funeral image of a family standing on both sides of a body wrapped in white; the scene is naturally lighted from the window in a Caravaggesque manner. The second exhibit is titled “Invasion” and was photographed in August 1968 as Russian troops and tanks invaded Prague. Koudelka loaded his camera with East German movie film and shot for six days. He then managed to process the film and Magnum smuggled the negatives to the US. The exhibit includes a video of a CBS newscast about the invasion, showing dozens of Koudelka’s images. View of the Ed Paschke gallery. Photo courtesy Ed Paschke Art Center. 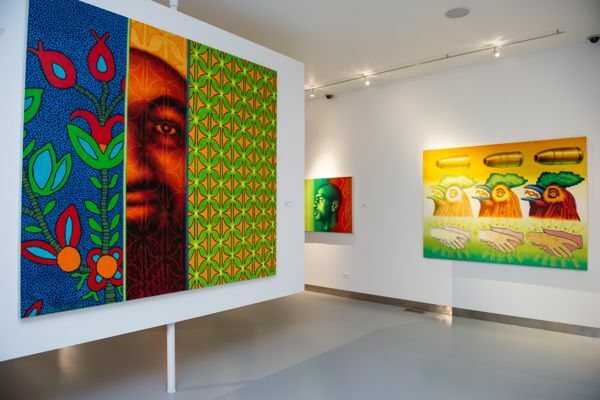 The Ed Paschke Art Center, a museum dedicated to the work of Ed Paschke of the Chicago Imagists, opened last month in Jefferson Park. I have always been a fan of Paschke’s work, which is brilliantly vivid and gorgeously grotesque. I visited the new center this week and wrote an article about it for Gapers Block. You can read it here and see a few images from the center. The 30-minute video is particularly interesting because Paschke is so articulate about how he works. There are interview segments from the 1970s and the early 2000s. 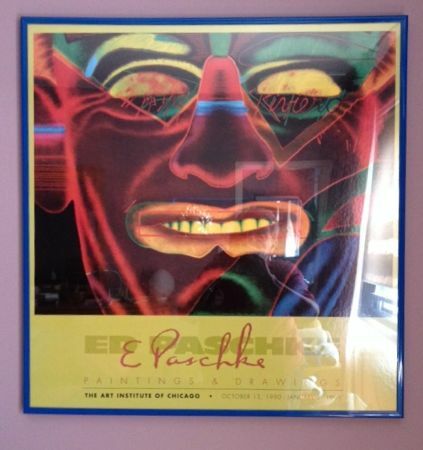 This poster is from the 1990-91 retrospective of Paschke’s work at the Art Institute. This poster has been hanging in my bedroom ever since and has lulled me to sleep every night.